New A/C! as well as ceiling fans in each room. Mahalo for your interest in our slice of paradise, Kuhio Shores #110, located in beautiful Poipu. We offer a quality large, 2 bedroom/2 bath, ground level condo with a spectacular ocean view and a lanai less than 30 feet from the shore. It provides a stunning, panoramic, ocean view from sunrise to sunset, with surf splashing along the shore. 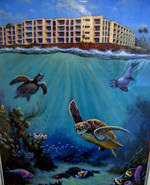 Enjoy snorkeling, surfing, and boogie boarding in front of the complex. Perhaps best of all, enjoy watching the sea turtles, whales, and sea life from the lanai. The unit has been recently remodeled and now includes A/C. The master bedroom features a pillow-top King mattress. The second bedroom has a comfy new Queen bed. Both bathrooms include showers with safety bars.. 3 HD flat screen TVs, high speed internet, DVD and CD players. Other features include ceiling fans in each room, tile floors, and granite counters in the kitchen and bathrooms. The kitchen was recently remodeled and is exceptionally equipped. Beach towels, chairs, snorkel sets, boogie boards, umbrella, and cooler are provided. Weber gas grill are located in the complex. We have an inflatable twin mattress with sheets and bedding if the two bedrooms aren't quite enough. Lawai Beach is about 100 yards from the lanai, just to the right of the lawn. Other small and large beaches are within walking distance or a short drive. Two fine golf courses (Poipu Bay and Kiahuna Golf Club) are located just minutes away in the immediate Poipu area. You can watch the sunset at the popular Beach House Restaurant which is located right next door. Kukui'ula Village, home to a variety of lovely shops and great dining, is a short walk from the complex. Kuhio Shores #110 is our slice of paradise and our home away from home. We would love it if you would make it yours as well! Please feel free to contact me if you have any questions. We visited Hawaii for three weeks and our stay at this condo for a week was a real treat. The view from both the living room and the kitchen was just amazing. Step out a few steps from the patio and you get both sunrises and sunsets. (We loved being on the ground floor and didn't feel at all unsafe.) In the evenings we sat on the patio or in the living room sipping Kona beer and staring out at the ocean. There were beautiful sea turtles around constantly, and we spotted quite a number of whales off in the distance. I can't think of a thing that the owners could do to improve this condo. We appreciated all the amenities and above all the quality of the decorating and appliances, with stone floors, tile in the bathrooms, nice appliances and tableware, etc. There is free wifi and two TVs. The variable-speed ceiling fans worked great to keep the place comfortable. The king-sized bed was very comfortable. The place was very clean, and it is decorated in a pretty neutral way so I think most people would feel at home (as we did). The pictures show it like it is. Coin-operated washers and dryers are available just 20 feet away. They were always available when we needed them. The location was perfect for us, especially in winter when north shore beaches are very rough. There are shops, dive outfitters, restaurants for many tastes, and interesting attractions within quick driving distance. You can swim and snorkel at the Beach House (easier entry) or at PK's (trickier entry but more turtles). Or enter at the Beach House beach and swim around to PK's, if the surf permits. Or try “snuba” at the Beach House beach! Showers outside the building help you avoid tracking sand into the condo. Communication with the owners and the local realtor leading up to the rental was always prompt, correct, and helpful. The key (with instructions) was waiting for us at our rental car agency upon arrival. In the condo there is a binder with instructions on how to use the condo, area attractions and restaurants, etc. There are even guide books and some fiction to enjoy! "... kitchen better than home ...."
"...first floor location really gives easy access to beach and sunbathing ..."
"... extra spacious for one bedroom condo ..."
"... pillow top king bed a real treat ..."
"... will definitely come back ..."